Twenty years ago, Spray Roses were merely a commodity product. Today, there are endless varieties that have completely reshaped the landscape of the Spray Roses. Garden Sprays, regular Sprays, an abundance of colors are available to meet your needs. Check out our Flower Gallery for a complete list of varieties. 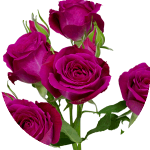 Spray Roses enjoy the same Care & Handling instructions as Roses, and we have listed these instructions extensively on our special Rose page, so please refer to that page.